Take 10-15 minutes to read the daily blog posts, consider your own life, & journal about your experience. I believe that KNOWLEDGE IS POWER & so I just want you to soak up the knowledge about how your thoughts affect you & how to lift your thoughts to a higher place. By choosing higher thoughts every day, for thirty days, you can develop a new & powerful habit that will help you in every area of your life. – Wear a rubberband for the next 30 days. Every time you catch yourself thinking a negative thought, pop yourself on the wrist. This will help you become more aware of the thoughts that are running through your mind. – Keep a tally on a piece of paper. Put a mark every time you think something negative. *I’ve changed things up a bit! See the UPDATE below! I’d like to tell you about something that has changed my perspective when it comes to creating new habits, why the number THIRTY is important, & how it can help you. Years ago, NASA conducted an experiment & made a surprising discovery. They were trying to determine what kind of effect being in a weightless environment for long periods of time would have on astronauts. So they created goggles that literally flipped their world upside down. The astronauts were required to wear these goggles 24/7. For 25 days, nothing changed, and then, on day 26, one of the astronauts had an amazing thing happen…his world turned right-side up again…even though he was still wearing the goggles! Within the next several days, the same thing happened to the others! NASA was fascinated by the surprising results & realized that they had discovered an amazing thing…the brain had rewired itself by creating new neural pathways in order to adapt to the new input that was coming in. They decided to continue this experiment, only this time they allowed the goggles to come off for short periods of time during the 30 days. In these experiments, the neural adaptation did not happen! In other words, it took approximately 30 days of constant, consistent, uninterrupted input of new ideas in order for the brain to create new neural pathways & accept it as normal. Choose to be consistent over the next 30 days by not missing a day. By doing this, you will be re-wiring your brain to pay more attention to your negative thoughts. You will also be training yourself to turn those negative thoughts into more powerful, positive ones. SO, are you committed? I’m changing up the challenge! One of my good friends, Alisa Hancock, left a comment below with a link to a video about “catching our thoughts”. After watching it, I’ve decided to change what I told you to do above. Instead of “catching your negative thoughts”, I’m going to have you focus on “counting your positive ones”. Watch THIS VIDEO & you’ll see why…(seriously, go watch it, it’ll make you smile)…CLICKING CAN CHANGE YOUR LIFE. I’m in! Thanks so much for sharing this idea and giving your time to prepare. This looks like a really positive, worthwhile thing to do and I can’t wait to get started. Thanks again. Yes, I’m in… very excited. This is just what I need to do! I am completely in!!! I love the tally mark idea!! I am a visual learner and I believe seeing this will help me SEE my progress. Thank you for doing another 30 day challenge. I know it must be a lot of work! I’m in. This idea of not thinking negative thoughts reminds me of Philippians 4:8 where we are told to think about the things that are true, honest, just, pure, and lovely! I’m in! This goes along great with the series that our Pastor has been preaching about!! Thank you, Crystal!!!!! I’m in. 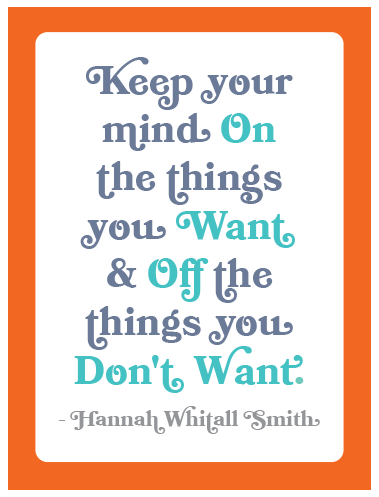 Hannah Withall Smith is one of my favs. I am at a place in my life where this is the right step at the right time. I am in for the challenge and look forward to it!!! So excited at the time that it came to be! I have to say- I haven’t checked your blog in a while and something told me to check it today. What perfect timing you have!! I am so excited to start a new 30 day challenge and start fresh with a new positive attitude and outlook!! Looking forward to it!!! I need this right now. Thanks! I’m definitely in! I am in. This seems like a good challenge for me and I can’t wait to see what happens. i am in! yes! i am so glad i ran across this! I am in!!! Just what I needed! I AM SO IN! THANKS FOR DOING THIS AGAIN…I HIGTHLY APPRECIATE IT! Hooray! I’m glad to see you back in action. I’m ready for another round. I like the new colors! I also like the rubber band idea…..I think….I may be in pain for a while! I like your ideas. You are getting so good at these challenges. Way to go! I’m in! I have a habit of quitting after several days, so I’m gonna get that rubber band out…definitely ouch, but yay to a better me! I am in… I will be going on Vacation on the 13-21, but I think I might be able to get wifi at the resort. I am totally in! Putting this with my daily workout regime and eating cleaner! It is going to be a WONDERFUL October!!!! I’m In! Just what I needed! Here’s hoping my goggles flip! Can’t wait for the journey!! I’m jumping in as well!! Can’t wait Crystal! This will be truly amazing! I’m in!!! I’m participating in a “Get Back On Your Bike” program and I’ve noticed an increase in the negative thoughts I have throughout the day. Not because the biking is bad but because of the negative chatter trying to sabotage this positive change in habit. Your e-mail came at the PERFECT time. THANK YOU!! This could not have happened at a better time for me! I am so in. I’m in, and so excited! My son and I will do this together. Thanks! I am in! Time to focus and get things in order again. I am in!! Thank you for running this challenge…it is very timely for me. I’m in and ready for a challenge to change my negative nancy attitude some days. I am ready to be made-over! I’m in…I tend to be my own worst enemy when it comes to my thoughts and self talk. I could defintely benefit from this! Great idea and thanks! Totally In. I have been WAITING for you to come back. So glad you are. Thank You for doing this!!! I’m in….and very grateful for you. I’m in! Love, love, the quotes so far!!! I am so in. love the rubberband idea. I have been during it since monday and really like it. Its helping me . Let’s go. Although I’m already starting late. This is awesome and just what I need! Thank you! Looks like I have some catching up to do! All for it! What a surprise to happen to come to the blog and see all of the new amazingness!!!! So happy to see you back and completely lifted and feel refreshed I need this I crave everything you do!!!! Love love love all of our words and for putting that spark back into my brain! Thank you thank you I’m excited!!! I’m in for sure! In this day and age, I need all the positive thinking I can muster up!!! I’m in and looking forward to it! Thank you! I am in! I definitely need this right now! I am so in!!!!! I was going to do last year’s 30 day gratitude challenge starting in November this year. Now, I can jump start that with this new challenge!!! I am a quote junky so this is all right up my alley!!!! By the way, I loved meeting you the other day!!! Small world!! I am looking forward to the entire 30 days. Thank-you. This idea reminded me of the song I sang as a youngster. Accentuate the Positive, Eliminate the Negative, Don’t mess around with Mr. In-between. I love it! I’m in! Thanks! I’m in!!! Excited about the project. So glad you’re joining the challenge Angela! I am in! This is great timing for me! Earlier today (before I saw which thought you posted), I watched Hilary Weeks’ video about positive thoughts: http://www.youtube.com/watch?v=-9PHrtc2EA8 — I am dragging out my clicker and starting to track my positive thoughts again during this challenge! I know so many people going through difficult challenges right now, and so I definitely need to increase my number of positive thoughts! Thanks for doing this, Crystal! I’m in the YW presidency right now too & I think it would be an awesome idea to give each of the girls a clicker & see what happens. 🙂 That scripture is perfect for this! I’m in. Maybe positive thinking could have kept this mom from going on strike today. Thanks for doing this. I’m doing this with my 3rd grade class. I am having them write their ideas in their writing notebooks. This morning’s responses were so interesting – I want to be better at math, I want the earth to be a cleaner place (we are studying habitats), I want to be content with what I have, etc! We then talked about the power of positive thinking and how I am depending on them for my future: that they will be my doctors, bankers, teachers of my grandchildren, etc. It made for a really good start of the day!!! Sherri, that is awesome! I’d love to know how it goes! Love it. Looking forward to these 15 minutes a day this month. Yes I’m in! Love it and looking forward to the next 30 days. Are you posting in Facebook also for 30 days? Can we share the quotes in our Facebook wall? So glad you’re in Paula! 🙂 I’m glad that I’m doing this again too…it’s been too long! Count me in! I am a huge space geek, but had never heard that particular NASA story before. LOVE it!!! That’s awesome Melinda! I know you can do it! How did you know how very much I need this. I am really going to work on this. This is something that I need right now! I am so in!!!! I’m in! thanks for sharing this journey with us! I definitely need this right now!! Thank you, needed this today, I have just started trying to walk every day & have done 2 days but had thought I would do it later today!!! I will go & put my sports shoes on & get outside now hehehehe. The NASA experiment showed what detox clinic etc have known for years, it takes at least 30 days to start the brain recovering from addiction etc. I will make a little album to put this challenge in, an important time in my life so a nice way to keep it for the future :). So excited for this day 1. I love this video. Such a great thing to do. So excited. Yea! Glad you’re joining the challenge Mandi! 🙂 That is a great video, isn’t it?! I love this idea!! Thanks for starting this. So happy you’re joining us for the challenge Cindy! I enjoyed the video and the song. I’m looking forward to your emails. Thank you and God bless. I’m in!! are life threatening, so we should really count our blessings. Thanks for creating this series. This is day one and finding that focusing on positive thoughts produces more positive thoughts is not something new to me but something I had really buried in the back of my mind. I was so happy to find this on Pinterest and look forward to the next 29 days. Thank you so very much for sharing this…the precious and timely (timeless) video, the lovely cards and thoughts….this whole concept! Thank you! i just found your blog and post …I’m starting today…any updates that you have added since you first wrote this post? ?